The casing and the impeller are made of high-quality durable plastic. Specially designed mixed-flow impeller profile ensures high air flow and low noise level. Protection rating IPX4. Low energy usage from 4.5 W. The models of Blauberg Ducto Series are equipped with a single-phase motor and are available in single- or two speed modifications. The motors have thermal overheating protection for motor overload prevention. Designed for PVC ducting systems or flexible ducts. From low to medium air flow motion for short distances at low air resistance. Compatible with Ø 100, 125 and 150 mm air ducts. Ducto Plus – reliable single-phase two speed motor. Ducto Power Plus – two-speed high-powered motor. Ducto T – modification with a regulated timer with the operating time from 2 to 30 minutes. Ducto W1 – modification with a power cord with IEC C14 electric plug. Manual speed control with a room light switch. It is not included in the delivery package. Smooth speed control with a thyristor speed controller (see Electrical Accessories). Several fans may be connected to the same controller. The models with timer are not compatible with a speed controller. Automatic fan control with the electronic control unit MCD 60/0.3 (see Electrical Accessories). The control unit is supplied separately. Automatic fan control with the timer T (built-in turn-off delay timer enables the fan operation within 2 to 30 minutes after the fan switching off). The fan operates at the 1st speed by default. Each set time (adjustable from 1 to 15 hours) the fan switches to the 2nd speed automatically and reverts back to 1st speed after 2 - 30 minutes operation with maximum capacity. The fan is mounted into a matching duct size. Fastening with clamps in case of flexible duct connection. The mounting bracket enables installation of the fan on horizontal and vertical flat surfaces (Ducto-U model). 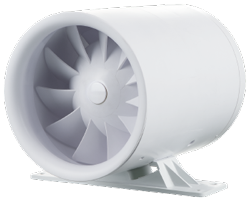 Two fans can be installed in series for higher operation pressure. Ducto-U – modification with a fixing bracket for flat surface mounting.